Columbus loves to get in the Buckeye spirit, and one way we show it is through good eat and drink. 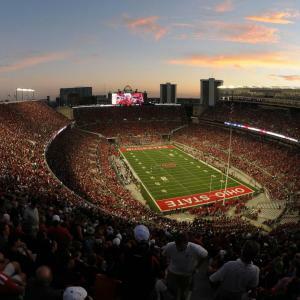 Visitors to the Ohio Stadium love to make the celebration a full-day affair, whether it’s stopping by a favorite restaurant before or after the game, or engaging in some good old tailgating. Near campus, visitors can find classic stops like Roosters or the Varsity Club. Roosters is a hometown favorite for wings, while the Varsity Club is a popular spot to grab a drink and a bite to eat while getting in the Buckeye spirit. If you’re getting an early start, you can take in all the Ohio State bobbleheads lined up at Jack & Benny’s, then feast on Buckeye pancakes and gutbusters. And of course, you can’t get into the game without a stop at Buckeye Donuts for a longjohn or a signature buckeye donut first! 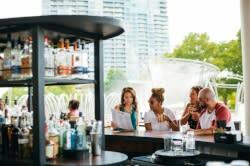 After the game, there are plenty of great bars and restaurants to visit around town, no matter which direction you travel. Diners might love tacos at Bakersfield or burgers at Philco Bar + Diner in Short North. There are black bean nachos and Cuban sandwiches at Starliner Diner in Hilliard, a huge beer list to explore at 101 Beer Kitchen in Dublin and Gahanna, or pizzas at Pies & Pints in Worthington or at Easton. In German Village, Buckeye fans can feast on brats at The Old Mohawk or upscale pub fare at The Sycamore. If you’re in the mood for beer, try the brew and smoked wings at Smokehouse Brewing in Grandview, or deli sandwiches at Uptown Deli & Brew in Westerville. 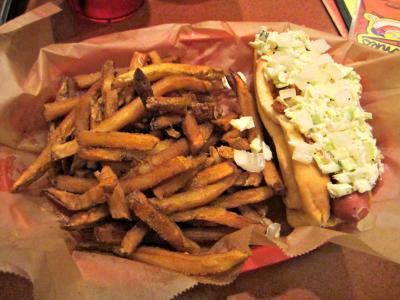 Downtown you can find great burgers at Barley’s or fish and chips at the Elevator Brewery & Draught Haus. 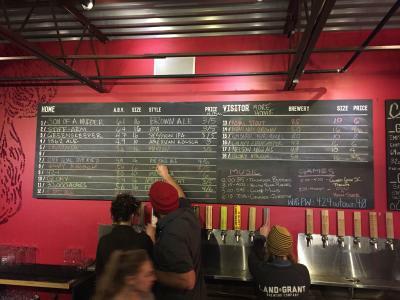 Land-Grant is another prime spot to grab some pints. Fourth Street downtown is worth a visit, too, with beers and classic arcade games at 16-Bit Bar + Arcade, then your choice of eats like hot dogs at Dirty Frank’s, poutine at Little Palace, and tacos at El Camino Inn. Picking up drinks or snacks for tailgating? Visit one of Columbus’ local grocery stores! Weiland’s Market in Clintonville has a full liquor store loaded with craft beers and locally made spirits. Pick up meats and cheeses from the market, or pre-made sandwiches and other meals. Stop by the Hills Market downtown or in Worthington, and collect snacks, cheeses, drinks, fresh pastries, and more. Huffman’s Market in Upper Arlington offers all the meats, cheese, breads, and snacks for all your tailgating needs.